We are one among the known trader and supplier of extensive range of Thermostatic Expansion Valve. Our offered products are from the brand leaders in the industry.The basic function of the expansion valve is to regulate the injection of refrigerant flow based on the super heat We provide these to our customers in the stipulated time frame and at a competitive price. Being leading trader and supplier, we offer comprehensive array of Thermostatic Expansion Valve to our esteemed clients. Our products are available as per the applications it is use for. 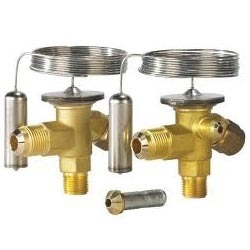 Thermostatic expansion valves regulate the injection of refrigerant liquid into evaporators. We offer these to our customers after testing them under the vigilance of our quality controllers. Looking for “Thermostatic Expansion Valve”?